B-534 Nizhny Novgorod is a Project 945A Condor nuclear-powered cruise missile submarine. The submarine was laid down on February 5, 1986 at the Krasnoye Sormovo shipyard; launched on July 8, 1989; commissioned on March 14, 1991 under codename of K-534. The submarine was renamed into B-534 on June 3, 1992; into B-534 Zubatka on April 6, 1993; and obtained the name of Nizhny Novgorod on March 25, 1995 being taken under patronage of the Nizhny Novgorod regional administration. Since May through September 1992 the sub took part in Northern Fleet's search operation in the North Atlantic. In 1993, the sub excellently performed patrol mission. In October-December 1994, the sub maintained state acceptance trials of Project 949A nuclear submarine K-141 in the White Sea. On 27 March 1997, the sub was blessed by father Vladimir. In 1997, the sub excellently carried out deployment including search and trailing of foreign submarines in the Norwegian and the Greenland seas, took part in Northern Fleet's tactical exercise. 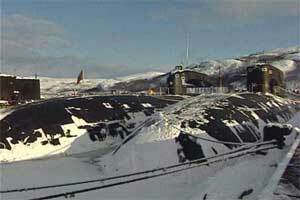 Reportedly, in December 2000, the sub was decommissioned after a contingency in nuclear reactor compartment. On 12 January 2002, the sub was transferred to Nerpa Ship Repair Plant (Snezhnogorsk, Murmansk region) to pass interim overhaul and recharge reactor core. In September 2002, spent nuclear fuel was discharged. In 2002, financing of the sub's repair was resumed after written petition of Nizhny Novgorod Governor Gennady Khodyrev addressed to president Putin, Navy Commander-in-Chief, and minister of nuclear energy. In 2005, basic recovery works started. On 30 April 2008, the sub left the shipyard for her permanent basing site in the Ara Bay. During the large-scale repairs, almost all equipment in the reactor compartment was replaced. Works held by the Nerpa shipyard along with leading experts were done on subs of this class for the first time. The experience acquired will be used in further repair works. As of 2008, the submarine is in service. One water-cooled and water-moderated reactor OK-650B (190 MW), one turbogear assembly (50,000 hp), four steam generators, two turboalternators, two feeding and two condensate-extraction pumps, two groups of storage batteries, two reversible transducers, multi-blade propeller screw, diesel generator ASDG-800. Six 533-mm torpedo tubes, Granat cruise missile launchers, 8 SAM system Igla launchers.